Is your marriage good, stale, or even dying? Then you must read 7 ESSENTIALS To Grow Your Marriage to greatness! 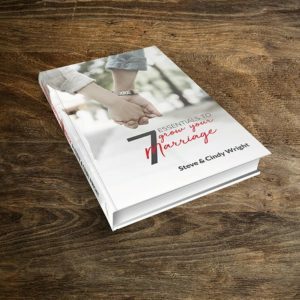 With 46+ years of personal marriage experiences and more than 25 years in marriage ministry, Marriage Missions International Co-Founders Steve and Cindy Wright provide the essentials to grow your marriage in ways you never thought possible. Pray, read, glean, and use what works for your marriage. In a conversational style, Steve and Cindy share practical/Biblical insights from each of their perspectives for a 360-degree view of each chapter. It’s a quick, easy read that packs the power to transform your marriage in God’s amazing ways. Written with both the wife and husband’s perspectives in mind you will find within this book the “essentials” they employed to make their 46 year marriage a great relationship. Through their transparency, humor, and a practical approach to various marriage issues, you too can learn from them how to take your marriage to new heights of love and mutual closeness. We are grateful for your purchase of our book and trust it will be a great blessing in your marriage. Intentionally, we have kept the price very low to make it affordable to most anyone. We ask that you honor our copyright and not share/forward the electronic version with others. Instead, encourage them to come to our web site to purchase and download their own copy. By doing so this will help sustain the ministry of Marriage Missions International. Thank You! Steve and Cindy Wright are real people, with a real marriage, and a real journey. They are giving all of us a gift. This gift is a front row seat to their struggles and determination to see God grow their marriage. This level of transparency is where life change begins. Their journey is expressed through their 7 Essential Tips. The very life essentials that helped them grow is now available to all of us. This is a powerful message from a couple that is committed to their marriage, even through the challenges. We have served in ministry with Steve and Cindy, and are excited to see their hearts’ expressed in a practical way to help others grow their marriages. If you’re looking for help from a couple who made all the right choices, have never struggled, and who are living “happily-ever-after,” don’t read this book. Steve and Cindy have been through the trenches, the bogs, the muck and mire of marriage. And they’ve persevered through those hard times to help you see you’re not alone and you can make it with God’s help. Their advice is encouraging and authentic. I don’t believe anyone escapes the struggles of marriage. But I also believe those struggles can propel you toward each other instead of away from each other. Use these principles to enrich your marriage and grow deeper in your relationship.